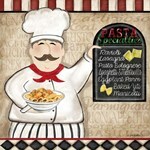 Pasta art is a beloved sub-category of culinary and food art that is based off of traditional Italian cuisine. This type of artwork is featured prominently in kitchens and restaurants around the world thanks to its whimsical depiction, mouth-watering colors, and friendly attitudes. 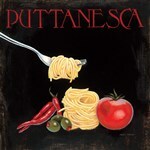 Like the country that it comes from, pasta artwork is casual and friendly. The most common style of this artwork often has stylized depictions that are almost cartoon-like in their execution. These works generally feature happy chefs, clowns, and diners experiencing the joy of cooking and fine dining. A typical example of this sort of treatment is seen in Sydney Wright's work, 'Pasta Fresca', which uses bright colors, stylized design, and whimsical graphic elements to portray a busy day in an Italian chef's life. 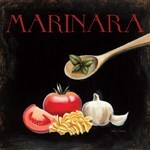 Image Size: 20" x 38"
Since creating pasta is considered an artform in and of itself in Italian culture, some contemporary cuisine artists choose to treat this culinary masterpiece with the respect and grace that they feel it deserves. 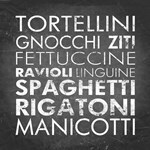 Darrin Hoover uses his pop art style to display a variety of Italian pasta such as fettuccine alfredo, rigatoni, fusilli, and the iconic spaghetti and meatballs. This treatment gives these subjects a unique vintage feel that is reminiscent of both the traditional restaurants of Italy and American diners from the 1950's. Pasta art is also given an acknowledging nod in recipe art because of its popularity and icon status among cooks. 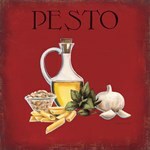 In Janet Stever's beautiful painting 'Pasta Italiano' the viewer is treated to all the ingredients necessary for making this dish, including noodles, tomatoes, garlic, mushrooms, and a variety of herbal seasonings which are all depicted in rich detail with a classically vintage background. Although less extensive than Italian cuisine art, pasta artworks still have a lot of variety for the consumer looking to add some warmth or frivolity to their kitchen or restaurant decor. 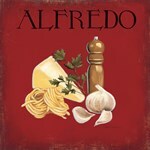 Depictions of ravioli, spaghetti, fettuccine, and more are all available in this art category. The styles of these artworks are also diverse, from art deco renditions to graceful classic representations of traditional Italian delicacies.